just right with a green salad for a light but hearty meal! Potato and escarole soup - Yum! This delicious soup is really healthy and hearty! 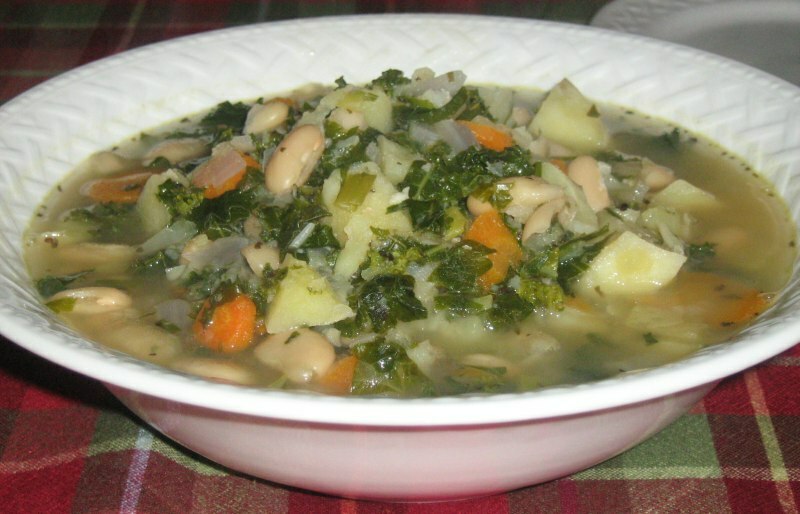 We are posting our friend Nava Atlas' original recipe for this terrific soup. As an adaptation we made it with kale instead of escarole. The kale worked just fine in this dish and made for a healthy and hearty soup that was tasty and filled with nutrition. Kale doesn't reduce as easily as escarole which gave the soup a chunky texture. Kale is considered to be a highly nutritious vegetable with powerful antioxidant and anti-inflammatory properties. Kale is very high in beta carotene, vitamin K, vitamin C, lutein, zeaxanthin, and reasonably rich in calcium. Oh! And did we mention it's delicious? Heat the oil in a large soup pot. Add in the onion and sauté over medium heat until translucent. Add the garlic and continue to sauté until both are golden, stirring frequently. Add the potatoes, carrots, broth, basil, thyme and 2 cups water. Bring to a gentle boil, then cover and simmer gently for 20 minutes, or until the potatoes and carrots are tender. Stir in the beans, escarole, and half the parsley. Simmer gently for 8 to 10 minutes, or until the escarole is tender. With the back of a wooden spoon or a potato masher, mash some of the potatoes in the soup to give it a nice base. Stir in more water as needed (up to 2 cups). The soup should be thick, but not overly so. Return to a simmer. Stir in the remaining parsley, and season with salt and pepper. If time allows, let the soup stand off the heat for an hour or more before serving, then heat through as needed. * Note: As mentioned, this soup is great with escarole or, as we tried in our adaptation, chopped kale. Simply follow the directions as written substituting the kale for the escarole.